Not only learner drivers, but some fully qualified drivers can have a fear of roundabouts. Here, we explain how to deal with roundabout traffic. Roundabouts can range from large and busy, to small, mini roundabouts that are defined only by road paint. One of the biggest fears for many drivers can be the safety aspect for when to go at roundabouts, especially at the busy ones. Statistically, roundabouts are the safest type of junction, they do however take practice to gain confidence. 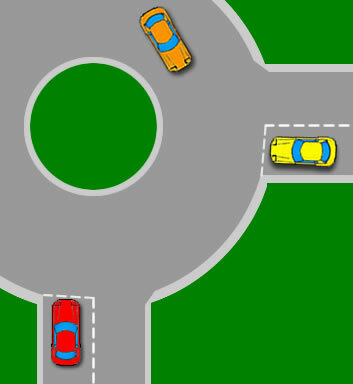 This section offers both learner drivers and experienced drivers tips for understanding when to go at roundabouts and dealing with the traffic, hazards, when to stop and when you should indicate. In order to gain confidence whilst driving on roundabouts, it’s important to fully understand how roundabouts work. If you unsure of the correct procedure or laws, read the roundabouts tutorial for the correct use of mirrors and signalling. Identifying roundabouts will certainly be of benefit. It sounds obvious, but many drivers forget to keep a keen eye out for road signs. The majority of large roundabouts have a sign before to warn drivers. Look out for other indications that a roundabout is ahead such as traffic crossing in front of you, road markings or chevron signs that can be on the roundabout itself. Identifying a roundabout in good time will provide you with more time to prepare. Once you are confident with how roundabouts work, identifying roundabouts and adopting the correct approach speed, the next phase is clutch control. Many learners or even experienced drivers fear making a quick entrance onto a roundabout due to stalling the car. Practice clutch control so that you can move off from a stationary position briskly and without stalling. Stalling at a roundabout isn’t necessarily a test failure however. If you stall before you enter the roundabout, this would be acceptable. If you stall just as you enter the roundabout and cause an obstruction, this may result in a failure. Whilst waiting for roundabout traffic to subside before moving, it may be of benefit to find the clutch biting point. Many drivers, especially learner drivers find that the bite point allows the car to move off quickly but also reduces the chances of stalling. To aid moving off quickly at a roundabout, once you have found the bite point, just before moving off, increasing the gas will allow you to release the clutch faster reducing the possibility of stalling. The more gas, the faster you can release the clutch and so the faster you will move from a stationary position. Too much gas and releasing the clutch too fast may however result in wheel spin. Roundabout tips 1. There is no definitive answer for when to go at a roundabout. Roundabouts require plenty of practice as the examiner will certainly be putting you through your paces during a driving test. Whilst driving on roundabouts, gain familiarity with the angles that cars drive. 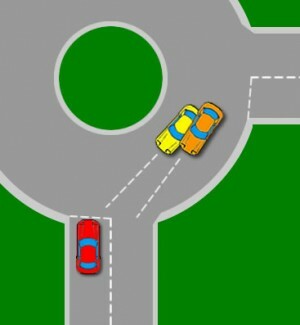 Yellow car: It may seem subtle in the diagram but the yellow car is clearly facing you as it rounds the circle. The yellow car is also keeping tighter to the inside than the orange car. This angle and position would suggest the yellow car is continuing round past your exit. Orange car: The orange cars position is more to the outside of the circle and the angle of the car is facing his next exit suggesting that they will be taking their very next exit. Learning to ‘read’ the position and angles of traffic on a roundabout will increase your ability for knowing when to go. Roundabout tips 2. Another roundabout tip for when to go is what the other waiting vehicles are doing. Some roundabouts can have trees or bushes on and are difficult to see what is coming round. Remember, everyone approaching a roundabout has to give way to the right. If the car is waiting to your right (the yellow car), this means that is giving way to a vehicle on the roundabout to his right. This is an ideal time to go. Roundabout tips 3. Imagine that you are a pedestrian standing in the same spot that you are sitting in your car at the roundabout. As a pedestrian you want to run from this position to the centre circle. When you feel it would be safe to do this as a pedestrian, it will also be a safe time to move off in your car. This tip applies to town based single or double lane roundabouts and not large high-speed multi-lane roundabouts. Of course it makes the situation much easier if a driver signals left when the intend on taking their next exit. Unfortunately many drivers do not bother which leaves you with trying to understand their position and angle. Identifying roundabouts in good time and the speed at which you approach a roundabout is critical. Approaching a roundabout too fast can often be fatal for a learner drivers test as they simply do not have enough time to think. The result of this can often be that the driver has to stop at the roundabout, even if it is clear to proceed. This can be dangerous for a vehicle behind as they may be far more experienced and did not expect you to stop, resulting in an accident. Identify roundabouts in good time and approach them slowly to give yourself plenty of time to think. This of course goes for any junction types and allows you to continue safely without the need to stop if all is clear. Likewise, be cautious of the vehicle in front. The roundabout may be clear of traffic and you may assume the vehicle in front will not stop – never assume anything and prepare for everything. The driver of the vehicle in front may not have been paying attention and stops at a clear roundabout, you’ll need to ensure you keep a safe stopping distance and that you observe them as well as traffic on the roundabout. It is not against the law to stop on a roundabout unless there is a yellow box located on the roundabout. It is necessary on a busy roundabout to get your place on the roundabout even if it means stopping on the roundabout itself. Be sure however, if on a driving test not to block exits and entrances to the roundabout. Doing so increases the congestion on the roundabout is and likely to fail your test. Large / long vehicles may have to take a different course of action as they approach or exit a roundabout due to their length and size. As an example, a long vehicle turning left at a roundabout may have to straddle lanes or use the right-hand lane to manoeuvre. Always be highly cautious of long vehicle at all junctions and prepare to keep clear and give them extra room. Although statistically roundabouts are a safer junction for vehicles, cyclists don’t fare so well. Before proceeding onto a roundabout, especially if you are turning left or following the road straight ahead, take a quick glance into your left mirror for cyclists. As a roundabout is circular, you will be steering towards the left as you enter, this could be directly into the path of a cyclists on your left side. Pedestrian crossings are often located at the entrance and exits of roundabouts. As you approach a roundabout, always try, if possible to observe your exit route to establish hazards such as pedestrian crossings – the fewer surprises you have whilst driving, the better. Even if there are no formal crossings, be aware that these locations may still have pedestrians crossing the road. You’re welcome Madhavi. Glad they have been useful. This website is perfect. Thank you! Thanks Valentina. Glad you are finding it useful.